It is a wonderful mystery that a person who’s life is so intrically intertwined with the concepts of perserverance and determination would one day restore a place and create from it a venue that would, without knowing it, epitomize so well these very concepts through its history and through a product of nature crafted half way across the globe, wine. 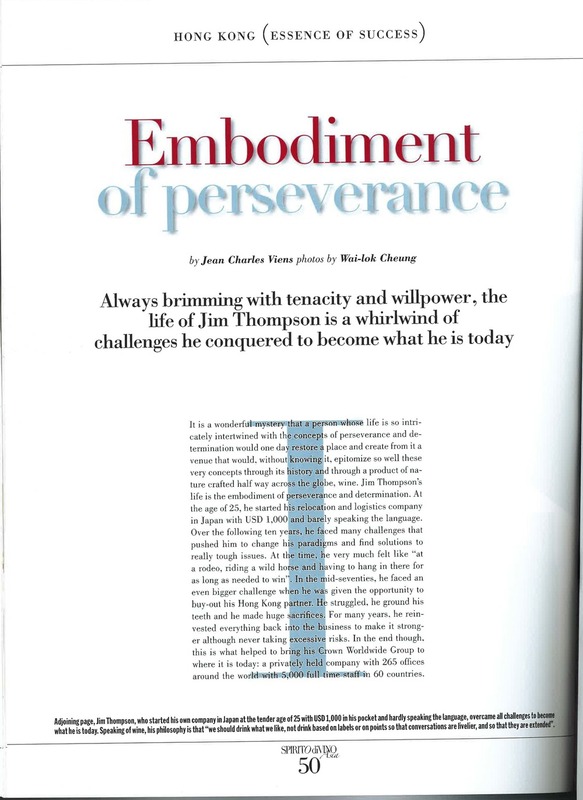 Jim Thompson’s life is the embodiment of perserverance and determination. At the age of 25, he started his relocation and logistics company in Japan with USD 1,000 and barely speaking the language. Over the following ten years, he faced many challenges that pushed him to change his paradigms and find solutions to really tough issues. At the time, he very much felt like “at a rodeo, riding a wild horse and having to hang in there for as long as needed to win”. In the mid-seventies, he faced an even bigger challenge when he was given the opportunity to buy-out his Hong Kong partner. He struggled, he ground his teeth and he made huge sacrifices. For many years, he reinvested everything back into the business to make it stronger although never taking excessive risks. In the end though, this is what helped to bring his Crown Worldwide Group to where it is today: a privately held company with 265 offices around the world with 5,000 full time staff in 60 countries focusing on relocation, document management, and fine arts & wine packing and transportation. When he set out to establish the Crown Wine Cellars with Gregory De’eb, a South African Diplomat in 2001, they faced a difficult start. Not only sites were hard to find but they eventually had to negotiate with 23 government departments, and many requests were made upon them to upgrade their plans. 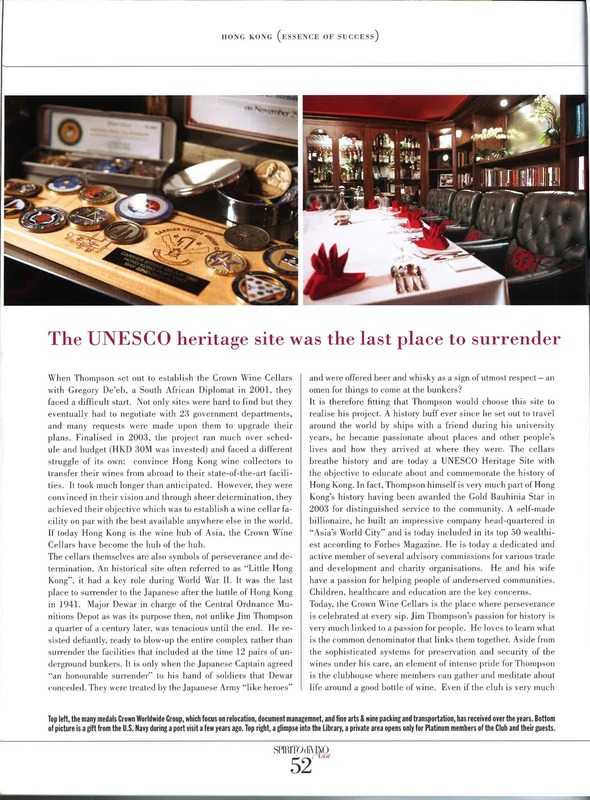 Finalised in 2003, the project ran much over schedule and budget (HKD 30M was invested) and faced a different struggle of its own: convince Hong Kong wine collectors to transfer their wines from abroad to their state-of-the-art facilities. It took much longer than anticipated. However, they were convinced in their vision and through sheer determination, they achieved their objective which was to establish a wine cellar facility on par with the best available anywhere else in the world. If today Hong Kong is the wine hub of Asia, the Crown Wine Cellars have become the hub of the hub. The cellars themselves are also symbols of perserverance and determination. An historical site often referred to as “Little Hong Kong”, it had a key role during World War II. It was the last place to surrender to the Japanese after the battle of Hong Kong in 1941. Major Dewar in charge of the Central Ordnance Munition Depot as was its purpose then, not unlike Jim Thompson a quarter of a centruy later, was tenacious until the end. He resisted defiantly, ready to blow-up the entire complex rather than surrender the facilites that included at the time 12 pairs of underground bunkers. It is only when the Japanese Captain agreed “an honorable surrender” to his band of soldiers that Dewar conceded. They were treated by the Japanese Army “like heroes” and were offered beer and whisky as a sign of outmost respect – an omen for things to come at the bunkers? It is therefore fitting that Mr Thompson would choose this site to realise his project. A history buff ever since he set out to travel around the world by ships with a friend during his university years, he became passionate about places and other people’s lives and how they arrived to where they are at. The cellars breathe history and are today a UNESCO Heritage Site with the objective to educate about and commemorate the history of Hong Kong. 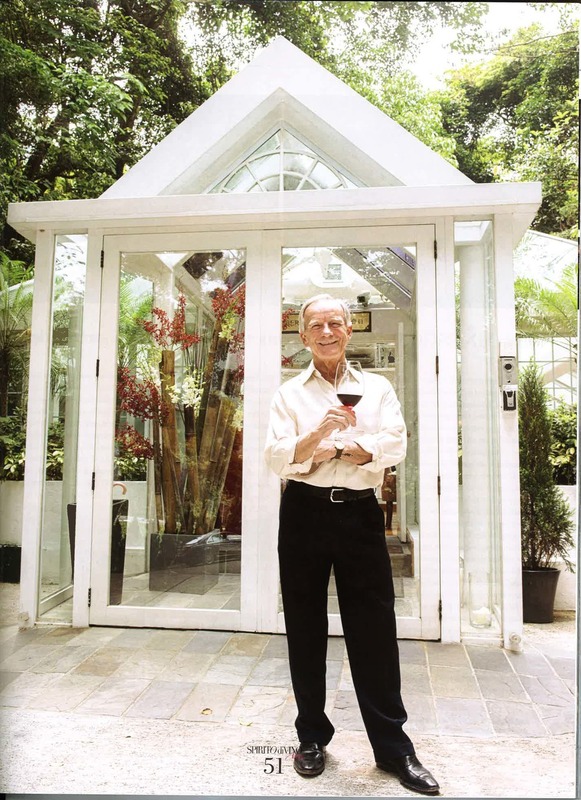 In fact, Mr Thompson himself is very much part of Hong Kong’s history having been awarded the Gold Bauhinia Star in 2003 for distinguished service to the community. A self-made billionaire, he built an impressive company head-quartered in “Asia’s World City” and is today included in its top 50 wealthiest according to Forbes Magazine. He is today a dedicated and active member of several advisory commissions for various trade and development and charity organisations. He and his wife have a passion for helping people of undeserved communities, especially those helping children, health and education. Today, the Crown Wine Cellars are the place where perserverance is celebrated at every sip. Jim Thompson’s passion for history is very much linked to a passion for people. He loves to learn what is the common denominator that links them together. Aside from the sophisticated systems for preservation and security of the wines under his care, an element of intense pride for Mr Thompson is the clubhouse where members can gather and meditate about life around a good bottle of wine. Even if the club is very much organised to cater to the most minute details of wine collecting, his real excitement when it comes to wine is to enjoy it with friends in the spirit of good humour. Through the years since the inception of the Crown Wine Cellars, he has been pleased to discover how much the Hong Kong community has a real passion for wine and a genuine desire to share it with each other. His philosophy is that “we should drink what we like, not drink based on labels or on points so that conversations are livelier, and so that they are extended”. He is especially fond of Barolo having visited several times where good moments were had with fellow members of the Knights Of Alba. It is somewhat wonderful that wine, made by people who work extremely hard and with outmost perserverance and determination not only in the vineyard but also the cellar would find such a place in Hong Kong where the fruit of their labour is embodied not only in its history, but in its ownership. Mr Thompson attributes his success to perserverence and also to the people who assisted him during times of struggles. And so, for him, wine is to share and to enjoy in the spirit of conviviality and fellowship to honour the struggles and the determination it is made from. During our conversation, we tasted a lip-smacking wine from a little known region of Italy called Valtellina, another representation of perserverance. The nebbiolo grapes it is made from are difficult to grow, often on very steep hills in the Alps. It is made from naturally partially dried grapes that do not always turn out to be the way the winemaker hope. Yet, it was a delicious example. Casa Vinicola Nera Sforzato di Valtellina 2005 – 85 – Medium Garnet with a wide rim. Complex nose showing depth of aromas with notes of forest floor, figs, dried raisins, and a thouch of herbs. Silky palate but firm and lively. Intense and moderate finish, very sapid, and seductive for another glass. Very Good.